The author wrote to a highly persecuted (Heb. 10:32-34) and most likely urban (Heb. 13:14) church. He was also familiar with this church, because he reproves them for their immaturity (Heb. 5:11-14). The believers had begun to buckle under persecution—not meeting together for fellowship (Heb. 10:25). Were they doubting their faith in Christ amidst religious pressure to return to old covenant formalism? This seems likely, and it makes sense of the authors’ repeated warnings not to apostatize. Since the book relies on OT citations more than any other book in the NT, he was most likely writing to a Jewish audience—not a Gentile one. The author assumed their rigorous knowledge of the OT. For instance, when writing about the story of Esau, he writes, “For you know…” Presumably, he was writing to Christians in Jerusalem who were enduring hostile persecution, but were losing confidence in their faith. “You showed sympathy to the prisoners and accepted joyfully the seizure of your property” (Heb. 10:34). This could refer to the seizure under Claudius’ expulsion in AD 49. Yet it could just as easily refer to the Jewish believers under persecution in Jerusalem. “You have not yet resisted to the point of shedding blood in your striving against sin” (Heb. 12:4). Acts states that the believers in Jerusalem did endure a bloody persecution. Yet Guthrie writes, “The Greek here is not so specific (mechris haimatos), for the words could refer to martyrdom or could be understood metaphorically in the sense of ‘uttermost.’” Even Lane writes that this expression “can be understood figuratively to mean, ‘You still have not done your utmost.’” This could be understood in the sense of Jesus’ literal shedding of blood (v.3), or it could be interpreted in light of the figurative shedding of blood, as in the athletic metaphor (vv.1-4). Hebrews 13:7 might point to earlier martyrs who had suffered death, but not the later believers. Clement of Rome cited Hebrews in the first century (AD 95). He cites Hebrews in 1 Clement 36:1-6. But this doesn’t prove that the letter was sent there—only that it travelled there or perhaps was simply written there—as our author states (Heb. 13:24). Presumably, the author had the letter copied before sending it. Other ancient authors (like Cicero) kept copies of their own letters, in case they were damaged or lost (Fam. 7.25.1; 9.26.1). Moreover, the Western portion of the Roman Empire was slow to accept the letter to the Hebrews in the canon, which would point against a Roman audience (compare this with Paul’s epistle to the Romans, which was readily accepted). The West was slower [to accept Hebrews], however, because of uncertainty as to its apostolic authorship, and possibly because individuals in the heretical Montanist sect appealed to Hebrews for one of their erroneous doctrines. In the fourth century, through the influence of Jerome and Augustine, the West finally recognized the epistle as canonical. One other reason that the West was slow in its deliberation was its stress upon apostolic authorship rather than apostolic authority as the correct test of canonicity. All good papers have a thesis statement—a short and concise way of explaining their main point. These first three verses are the thesis statement of Hebrews: Jesus is God, and the supreme and final revelation of God. The author spends the next ten chapters expounding upon this central theme. (1:1) “God, after He spoke long ago to the fathers in the prophets in many portions and in many ways.” God formerly spoke in various ways: the Scriptures, visions, dreams, etc. The author is writing to a Jewish audience, so he doesn’t feel the need to justify the claim that God speaks. His Jewish readers were already persuaded of the fact that God exists and that he wants to communicate himself and his will to humans. If the infinite-personal God exists, then what would be the greatest expression of him speaking to us? His Son incarnate! (1:2) “In these last days has spoken to us in His Son, whom He appointed heir of all things…” This can also be translated “at the end of these days.” Morris writes, “‘In these last days’ is more literally ‘on the last of these days.’ The expression is found in the LXX, where it not infrequently refers in some way to the days of the Messiah (e.g., Num 24:14).” If this is the case, then the author could be alluding to the end of the old covenant. “…through whom also He made the world.” Earlier in Isaiah, we read, “I, the LORD, am the maker of all things, stretching out the heavens by Myself and spreading out the earth all alone” (Isa. 44:24). Here, God (LORD = Yahweh) claims to be the sole Creator of the universe. Yet the author of Hebrews states that Jesus is the Creator. This means that Jesus is Yahweh. (1:3) “And He is the radiance of His glory…” John states that Jesus’ entire incarnation and ministry was “glory” (Jn. 1:14). “…and the exact representation of His nature…” The “exact representation” is the Greek term charakter. Guthrie writes that this is “the word for a die or an engraving. It is highly expressive since a stamp on a wax seal will bear the same image as the engraving on the seal.” Morris writes, ““Exact representation” translates charaktēr, a very unusual word (here only in the NT). Originally it denoted an instrument for engraving and then a mark stamped on that instrument. Hence it came to be used generally of a mark stamped on a thing, the impress of a die. It might be used figuratively, for example, of God as making man in his own image (1 Clement 33:4). In its literal sense it was used of the impression on coins; RSV’s ‘bears the very stamp of his nature’ brings out something of this meaning.” Jesus has the exact nature of the Father. “…and upholds all things by the word of His power.” Jesus not only created the universe, but sustains the universe as well. “…When He had made purification of sins, He sat down at the right hand of the Majesty on high.” What did Jesus do with all of this power and glory? He paid for human sin! The author spends the next twelve chapters unpacking exactly how this all works. (1:3) Doesn’t the author of Hebrews claim that Jesus is spiritually fulfilling the Davidic covenant, because he is currently sitting on a throne in heaven? In this section, the author of Hebrews gives a case for the superiority of Christ over angels. (1:4) “Having become as much better than the angels, as He has inherited a more excellent name than they.” Angels usually gave God’s revelation to people. So in saying that Jesus revealed the character of God, we might think that he was just a powerful angel. Of course, the author has already disproven this by calling Jesus the Creator, Sustainer, and Redeemer. But here he explicitly tells us that Jesus is far superior to angels. He defends his position by citing a number of passages from the OT. Remember, this audience would’ve viewed the Bible as the ultimate authority, so the author would’ve needed to make his case by appealing to the Hebrew Scriptures. (1:5) “For to which of the angels did He ever say, ‘You are My Son, today I have begotten You’? And again, ‘I will be a Father to Him and He shall be a Son to Me’”? (1:5a) Why does the author of Hebrews quote Psalm 2:7? Also, was Jesus “begotten” in the sense of being a created being? Psalm 2:7 is a messianic psalm about the coronation of King Messiah. The author cites this passage to show that the King Messiah would be called God’s son. The Messiah is a son, which is better than a servant (Heb. 1:14). Next, the author cites 2 Samuel 7:14, which predicted the permanent and eternal covenant with David (see “Abrahamic and Davidic Covenants”). God promised that one of David’s descendants would be his son. (1:6) “And when He again brings the firstborn into the world, He says, ‘And let all the angels of God worship Him.’” If the angels are worshipping Jesus, how much more should we worship him? This is either a citation of Psalm 97:7, or the song of Moses in Deuteronomy 32:43 in the Septuagint (LXX). Septuagint (LXX): “O heavens, rejoice together with him, and let all the sons of God worship him. Rejoice, O Gentiles, with his people, and let all the angels of God regain their strength. Psalm 97:7. More likely in our mind, the author is quoting from Psalm 97:7, which reads, “Let all those be ashamed who serve graven images, who boast themselves of idols; worship Him, all you gods.” The purpose of this citation is the fact that the angels (“gods” Elohim) are called to worship Yahweh. If Jesus is God, then even the angels owe allegiance to him, showing Jesus’ superiority over them. (1:8) “But of the Son He says, ‘Your throne, O God, is forever and ever, and the righteous scepter is the scepter of His kingdom.’” The author calls the Son “God,” and he emphasizes the king’s “scepter” to show his sovereignty and authority. (1:8) Does Psalm 45:6 refer to Jesus or to Yahweh? (1:9) “You have loved righteousness and hated lawlessness; therefore God, Your God, has anointed You with the oil of gladness above Your companions.” The Son is a lover of righteousness, called “God,” and he has been anointed by God himself. (1:13) “But to which of the angels has He ever said, ‘Sit at My right hand, until I make Your enemies a footstool for Your feet’?” This is a citation of Psalm 110:1. The OT supports that the Messiah will rule over everyone, including angels. For more on Psalm 110, see comments on Matthew 22:41. (1:14) “Are they not all ministering spirits, sent out to render service for the sake of those who will inherit salvation?” The author brings all of these citations together by showing that angels are “ministering spirits.” That is, angels are here to serve humans who inherit salvation. They don’t receive worship, receive salvation, or receive a kingdom. (2:1-3) “For this reason we must pay much closer attention to what we have heard, so that we do not drift away from it. 2 For if the word spoken through angels proved unalterable, and every transgression and disobedience received a just penalty, 3 how will we escape if we neglect so great a salvation? After it was at the first spoken through the Lord, it was confirmed to us by those who heard.” Paul’s audience would’ve believed that they should accept the old covenant, but what if God has now transitioned into a new and better covenant? The imperative builds on all of chapter 1. If we listen to angels who brought us the OT, how much more should we listen to the final revelation of God: his Son? (2:2) What is the word spoken through angels? Is our view of the person and work of Jesus really that important? How might our view of Jesus affect our practical life in the areas of prayer, ministry, and security with God? (2:3-4) “How will we escape if we neglect so great a salvation? After it was at the first spoken through the Lord, it was confirmed to us by those who heard, 4 God also testifying with them, both by signs and wonders and by various miracles and by gifts of the Holy Spirit according to His own will.” We might be tempted to toy with the idea that this refers to God speaking the OT Scriptures. Consequently, these OT saints passed down the word to us. Yet the mention of spiritual gifts implies that the gifts of the Holy Spirit refer to the new covenant. It seems that the apostles are in view. If this is Pauline authorship, then this would mean that Paul heard his message from the apostles who were with Jesus in his earthly ministry. Paul travelled to visit with the apostles to hear about this for two weeks, so this is a possibility (Gal. 1:18-19). If it isn’t Pauline authorship, then this would imply that these Christians are second generation believers from the apostles. (2:5) “For He did not subject to angels the world to come, concerning which we are speaking.” While humans are not as smart, strong, or old as angels, we are praised more in God’s plan. Humans were given dominion over the Earth—not angels (cf. Gen. 1:28). Humans receive salvation—not angels (Heb. 1:14). Not only is Jesus greater than angels by virtue of his deity, he’s also greater because of his humanity. (2:6-8) Why does the author cite Psalm 8:4-6? (2:10) “For it was fitting for Him, for whom are all things, and through whom are all things, in bringing many sons to glory, to perfect the author of their salvation through sufferings.” NIV and NLT say that God brings us to glory. Yet this is only a inference of the interpreters. The Greek doesn’t contain the word “God,” and it only uses a pronoun (“Him”). The nearest antecedent for the pronoun is Jesus in the previous verse. So this could refer to Jesus, who is the “author of their salvation” (Heb. 12:2). (2:10; cf. 5:8-9) Was Jesus imperfect or incomplete? (2:11) “For both He who sanctifies and those who are sanctified are all from one Father; for which reason He is not ashamed to call them brethren.” God isn’t ashamed to call us his family, because he has worked to change us to become like his Son. (2:12) “Saying, ‘I will proclaim Your name to My brethren, in the midst of the congregation I will sing Your praise.’” Why does the author cite Psalm 22:22? If we look at the context of Psalm 22, this is a psalm of David about a Righteous Sufferer. The figure cannot be David, because David didn’t die surrounded by his enemies, with his hands and feet pierced, thirsty, etc. (cf. 1 Kings 2:10). Instead, David is writing in the first person about a Righteous Sufferer. The first half of the psalm (vv.1-21) describe the torture and death of the Righteous Sufferer, while the second half (vv.22-31) refers to the exaltation and effect of the Righteous Sufferer’s death. Because of his death, all the nations of the world worship Yahweh! Of course, we are currently in this era, seeing the message of Christ reaching the world. The author quotes this passage to demonstrate that Jesus suffered and died (Heb. 2:10), but this was for the purpose of reaching the world (Heb. 2:11). A profound citation! (2:13) Why does the author quote Isaiah 8:17-18? (2:14-15) “Therefore, since the children share in flesh and blood, He Himself likewise also partook of the same, that through death He might render powerless him who had the power of death, that is, the devil, 15 and might free those who through fear of death were subject to slavery all their lives.” Apparently, Satan uses the fear of death to keep us captive. Any time we think of death, we are filled with worry, anxiety, and fear. We suppress the truth about God, because we fear him too. If only we would come under the grace of God, we would be liberated from this fear. Jesus says that he holds the keys of death (Rev. 1:18; cf. 1 Cor. 15:54-57). (2:16) “For assuredly He does not give help to angels, but He gives help to the descendant of Abraham.” God didn’t need to die for humans. For instance, angels rebelled against God, but he didn’t die for them. (2:17) “Therefore, He had to be made like His brethren in all things, so that He might become a merciful and faithful high priest in things pertaining to God, to make propitiation for the sins of the people.” Jesus needed to be God to pay for sin, but he needed to be human to identify with us. For comments on “propitiation,” see Romans 3:25. (2:18) “For since He Himself was tempted in that which He has suffered, He is able to come to the aid of those who are tempted.” Jesus not only died for us in the past, but he can sympathize and aid us in the present. Based on verses 14 and 15: The author claims that people fear death. In what ways might the fear of death affect our lives? How would the fear of death “subject us to slavery all our lives” as the author states? Consider showing clips from the 2003 documentary “Flight from Death,” which is based on the work of Ernest Becker. They give their view of how to solve this problem at 1 hour and 14 minutes. Basically, they hold that we should just create an “illusion” to pacify our worry of death. Watch a couple minutes and discuss. The author also refers to him as our “high priest,” which he will unpack in later chapters. He must be introducing the topic here as a teaser for what he will explain later in the letter. Of all Biblical personages Moses has been chosen most frequently as the subject of later legends; and his life has been recounted in full detail in the poetic haggadah. As liberator, lawgiver, and leader of a people which was transformed by him from an unorganized horde into a nation, he occupies a more important place in popular legend than the Patriarchs and all the other national heroes. His many-sided activity also offered more abundant scope for imaginative embellishment. A cycle of legends has been woven around nearly every trait of his character and every event of his life; and groups of the most different and often contradictory stories have been connected with his career. It would be interesting to investigate the origin of the different cycles, and the relation of the several cycles to one another and to the original source, if there was one. The present article attempts to give, without claiming completeness, a picture of the character of Moses according to Jewish legend and a narrative of the most important incidents of his life. A peculiar and glorious light filled the entire house at his birth (ib. ; “S. Y.” p. 112b), indicating that he was worthy of the gift of prophecy (Soṭah l.c.). He spoke with his father and mother on the day of his birth, and prophesied at the age of three. [Pharaoh’s daughter had leprosy, but when she picked up baby Moses she] was cured of her leprosy (Ex. R. i. 27). [Pharaoh] delivered him to the executioner, who chose a very sharp sword with which to kill Moses; but [Moses’] neck became like a marble pillar, dulling the edge of the sword (“M. W.” l.c.). At age 27 Moses became King of Ethiopia and ruled 40 years. Of course, none of these statements are biblical or historical, but they show how much Jewish tradition sought to venerate Moses! Here, the author of Hebrews takes the opposite approach, showing the superiority of Christ to Moses. He begins by showing a similarity between Jesus and Moses: both were faithful. Next, he proceeds to show their differences. (3:3-4) “For He has been counted worthy of more glory than Moses, by just so much as the builder of the house has more honor than the house. 4 For every house is built by someone, but the builder of all things is God.” Moses served in the house, but Jesus built the house. There is some dispute over who is the builder: God or Jesus. Since Jesus is God and the Creator of all things (Heb. 1:2), it seems natural to see Jesus as the builder here. (3:5-6) “Now Moses was faithful in all His house as a servant, for a testimony of those things which were to be spoken later; 6 but Christ was faithful as a Son over His house—whose house we are, if we hold fast our confidence and the boast of our hope firm until the end.” Why is Jesus greater than Moses? Moses was a servant in the house (Num. 12:7), but Jesus is the Son of the house. In ancient culture, a son and a servant might perform the same functions, but one has a higher status than the other. You could argue that Jesus and Moses both did similar things, but the author is noting that Jesus is greater because of who he is, rather than just what he does. (3:6) Does this passage make our salvation conditional on endurance? Like what you do is never effective enough? Like you don’t compare that well to others? If you feel this way, then this chapter of Scripture should speak powerfully to you! All of these feelings could be symptomatic of being under law, rather than under grace. This entire chapter culminates in the conclusion that we can rest from our works (Heb. 4:10). (3:7-4:11) What is “the rest” mentioned here? (3:7-11) “Therefore, just as the Holy Spirit says, ‘Today if you hear His voice, 8 Do not harden your hearts as when they provoked Me, as in the day of trial in the wilderness, 9 Where your fathers tried Me by testing Me, and saw My works for forty years. 10 Therefore I was angry with this generation, and said, ‘They always go astray in their heart, and they did not know My ways’; 11 As I swore in My wrath, ‘They shall not enter My rest.’” The author cites from Psalm 95:7-11, which refers back to the failure at Kadesh Barnea (Num. 14:23). We read that the Israelites were afraid to take the land—even though God had promised it to them (Num. 13:21-33). Their fears made sense—only if they didn’t factor God into the equation. The people tried to stone Moses and Aaron for leading them into the Promised Land (Num. 14:1-10). They started with common-sense observations, but they ended with murderous blasphemy (Num. 14:10)! Hardened hearts are this way. When we argue against God’s word in one area, this easily carries over into every other area. If one compromise makes sense, why not another? Their compromises were corrosively tearing their faith apart. God judged this entire generation for their unbelief (Num. 14:29-31). At the time, the people in the wilderness couldn’t see this clearly. The Conquest was new, different, scary. Looking back now, it’s entirely clear that they were in the wrong. The same is true of our failure to trust God retrospectively. (3:12) “Take care, brethren, that there not be in any one of you an evil, unbelieving heart that falls away from the living God.” The author doesn’t want history to repeat itself. (3:13) “But encourage one another day after day, as long as it is still called ‘Today,’ so that none of you will be hardened by the deceitfulness of sin.” We can’t bring this encouragement of faith if we do not have it ourselves. (3:14) Does this passage make our salvation conditional on endurance? (3:15) “While it is said, ‘Today if you hear His voice, do not harden your hearts, as when they provoked Me.’” The author keeps emphasizing that they can turn back to God, provided they can still hear his voice. (3:19) “So we see that they were not able to enter because of unbelief.” The author is driving home the point that unbelief was at the root of their sin, unbelief, and apostasy. Based on verse 6: Why would these Jewish believers in Jerusalem be tempted to reject grace teaching? Wouldn’t grace teaching always be more attractive to accept? Based on verse 13: What are signs that someone is starting to develop a hardened heart? (4:2) “For indeed we have had good news preached to us, just as they also; but the word they heard did not profit them, because it was not united by faith in those who heard.” Just like those at Kadesh Barnea, these first-century believers had “heard” from God (Heb. 3:16). But they were guilty of unbelief (Heb. 3:19). (4:3) “For we who have believed enter that rest, just as He has said, ‘As I swore in My wrath, they shall not enter My rest,’ although His works were finished from the foundation of the world.” This is a citation of Psalm 95:7. (4:4) “For He has said somewhere concerning the seventh day: ‘And God rested on the seventh day from all His works.’” This is a citation of Genesis 2:2. (4:5) “And again in this passage, ‘They shall not enter My rest.’” This is a citation of Psalm 95:11. (4:6) “Therefore, since it remains for some to enter it, and those who formerly had good news preached to them failed to enter because of disobedience.” Disobedience is equated with unbelief. (4:7) “He again fixes a certain day, ‘Today,’ saying through David after so long a time just as has been said before, ‘Today if you hear His voice, do not harden your hearts.’” This is a citation of Psalm 95:7. Humans forfeited God’s finished work at the beginning of creation (Gen. 2:2). Humans forfeited God’s finished work at Kadesh Barnea (Num. 13-14). Humans forfeited God’s finished work in the day of David (Ps. 95). And now, these believers were forfeiting God’s finished work through Christ! (4:8-9) “For if Joshua had given them rest, He would not have spoken of another day after that. 9 So there remains a Sabbath rest for the people of God.” The author is pointing out that God’s rest is still in effect “today,” not just hundreds or thousands of years ago. (4:12) “For the word of God is living and active and sharper than any two-edged sword, and piercing as far as the division of soul and spirit, of both joints and marrow, and able to judge the thoughts and intentions of the heart.” In the context, God has been speaking, and the people were supposed to listen to his voice (Heb. 3:7, 15, 16; 4:2, 7). When God speaks, we’re supposed to listen. Of course, this applies to Scripture, which the author has been quoting throughout this section. The metaphor of a sword implies that God uses his word to powerfully pierce us and perform spiritual surgery. Often, as we sit in front of the word, God challenges us, reminds us, or leads us. “Living” (zao) comes at the beginning of the sentence, which was the Greek way to show emphasis and intensity (“The word of God is living!”). “Active” (energes) is the root for the English term “energy.” It refers to “capability, effective, active, powerful” (BDAG). “Judge” (kritikos) doesn’t refer to judgment, but to discernment (i.e. judging right from wrong). (4:13) “And there is no creature hidden from His sight, but all things are open and laid bare to the eyes of Him with whom we have to do.” The term “laid bare” (trachēlizō) was a wrestling metaphor, whereby the wrestler would struggle and pin his opponent. Morris writes, “It was used of wrestlers who had a hold that involved gripping the neck and was such a powerful hold that it brought victory. So the term can mean ‘to prostrate’ or ‘overthrow.’ Those who accept this meaning render this verse in this way: ‘All things are naked and prostrate before his eyes.’” If this is the meaning, perhaps it’s saying that God will wrestle with our thoughts, motives, and values through his word. This passage also shows us that we can’t fake faith. God can see right into our hearts. (4:14-16) “Therefore, since we have a great high priest who has passed through the heavens, Jesus the Son of God, let us hold fast our confession. 15 For we do not have a high priest who cannot sympathize with our weaknesses, but One who has been tempted in all things as we are, yet without sin. 16 Therefore let us draw near with confidence to the throne of grace, so that we may receive mercy and find grace to help in time of need.” After all of this talk about God knowing, convicting, and seeing our sin, we might be tempted to retreat from God in fear. Yet the author tells us to move toward him instead. Why? We have a gracious mediator!—a high priest who can intercede for us and sympathize with our weaknesses. (4:15) How could Jesus be tempted? Based on verses 10-11: How do we harmonize this? What does it look like to “rest,” while also “making every effort”? (5:1-7; 7:1-28) Who is Melchizedek? (5:1) “For every high priest taken from among men is appointed on behalf of men in things pertaining to God, in order to offer both gifts and sacrifices for sins.” In the old covenant, God would appoint one high priest to stand in between him and the people. The high priest would offer sacrifices for the sins of the people. (5:2) “He can deal gently with the ignorant and misguided, since he himself also is beset with weakness.” The high priest could sympathize with the people, because he himself was a fallen human. Earlier, the author noted that Jesus can sympathize with our weakness, but not because he himself was sinful (Heb. 4:15). (5:3) “And because of it he is obligated to offer sacrifices for sins, as for the people, so also for himself.” Since the high priest was himself sinful, he didn’t just offer sacrifices for the people, but for himself as well. (5:4) “And no one takes the honor to himself, but receives it when he is called by God, even as Aaron was.” You couldn’t simply volunteer for the position of high priest. God had to appoint you to this role. High priests needed to come from the line of Aaron. (5:5-6) “So also Christ did not glorify Himself so as to become a high priest, but He who said to Him, ‘You are My Son, today I have begotten You’; 6 just as He says also in another passage, ‘You are a priest forever according to the order of Melchizedek.” The author cites Psalm 2:7, because he had already established the fact that Jesus was God’s unique son. Here, he trades on the fact that God not only called him a son (Ps. 2:7), but also a priest (Ps. 110:4). Jesus didn’t call himself a high priest. God called him this in Psalm 110:4. Since Jesus was not from the line of Aaron, the author needs to explain how Jesus could be both the Messianic King and the final High Priest. (5:7) “In the days of His flesh, He offered up both prayers and supplications with loud crying and tears to the One able to save Him from death, and He was heard because of His piety.” Jesus identified with us in his humanity. Like the high priest, he was fully human. This is likely a reference to the Garden of Gethsemane (“prayers and supplications… loud crying and tears…”). (5:8-9) Was Jesus imperfect or incomplete? (5:10) “Being designated by God as a high priest according to the order of Melchizedek.” Instead of connecting Jesus with the priesthood of Aaron, the author connects Jesus with the greater priesthood of Melchizedek. (5:11) “Concerning him we have much to say, and it is hard to explain, since you have become dull of hearing.” Instead of completing his argument about Melchizedek, the author takes a break to address his audience. He will return to this argument about Melchizedek in chapter 7 (specifically starting in Heb. 6:20). The author states that his audience had become dull of hearing. They were capitulating to the religious pressure, and they weren’t open to hearing deeper truths. As we study the priesthood of Melchizedek, we discover an incredibly complex, interlocking web of spiritual truth. While the information is there, are we willing to do the study and understand it? It’s not that these people were too unintelligent to understand. It’s that they were unwilling to learn (cf. 1 Cor. 2:14; Mt. 13:12). (5:12) “For though by this time you ought to be teachers, you have need again for someone to teach you the elementary principles of the oracles of God, and you have come to need milk and not solid food.” These believers had a Jewish background, yet they were not progressing in their spiritual growth. They should be at the point where they could teach others. “Elementary principles” (stoicheia) refers to the basics of learning. Plato uses stoicheia of children learning the alphabet (BDAG). (5:13) “For everyone who partakes only of milk is not accustomed to the word of righteousness, for he is an infant.” What’s wrong with being an infant? Nothing, unless you’re twenty five years old, throwing your food on the ground and defecating in your pants! There’s something strange about people who refuse to grow up physically or relationally, and the same is true for those who won’t grow up spiritually. (5:14) “But solid food is for the mature, who because of practice have their senses trained to discern good and evil.” We’ve all met the “theologian” who talks about spirituality and doctrine, but never puts it into practice (Jas. 1:22-25). Discernment takes practice. Based on verse 13: (Devil’s advocate question) Is the author of Hebrews using guilt to motivate these Christians into teaching the Bible? Is he being legalistic by saying that they should be further along spiritually by now? Based on verse 14: What are some key ways to build our discernment in theology and in practical ministry? (6:1-9) Does this passage threaten eternal security? The author switches subjects to believers who should hold fast to the promises of God. What can we learn about the promises of God here? (6:9) “But, beloved, we are convinced of better things concerning you, and things that accompany salvation, though we are speaking in this way.” These are things that “accompany salvation,” not the salvation itself. (6:10) “For God is not unjust so as to forget your work and the love which you have shown toward His name, in having ministered and in still ministering to the saints.” God won’t forget our good works. He is watching. When we’re in the midst of suffering for Christ, we need to remember that he will be “with us until the end of the age” (Mt. 28:20). He hasn’t abandoned us (Heb. 13:5). He is watching our faithfulness. (6:11) “And we desire that each one of you show the same diligence so as to realize the full assurance of hope until the end.” By doing good works and loving people (showing “diligence”), we get a subjective “assurance” of salvation. This is for our benefit—not God’s benefit. God knows the heart (Heb. 4:13). (6:12) “So that you will not be sluggish, but imitators of those who through faith and patience inherit the promises.” Being “sluggish” is the opposite of “faith and patience.” Patience must not be a passive quality—but an active quality. (6:13-15) “For when God made the promise to Abraham, since He could swear by no one greater, He swore by Himself, 14 saying, ‘I will surely bless you and I will surely multiply you.’ 15 And so, having patiently waited, he obtained the promise.” God’s promise to Abraham was based on his own character—not humans. God’s role involves dealing out his promises. Our role is to wait patiently. (6:16) “For men swear by one greater than themselves, and with them an oath given as confirmation is an end of every dispute.” Once you swear to God, that’s the end of the discussion. God can’t swear by a higher authority, so he swears by himself. (6:17-19) “In the same way God, desiring even more to show to the heirs of the promise the unchangeableness of His purpose, interposed with an oath, 18 so that by two unchangeable things in which it is impossible for God to lie, we who have taken refuge would have strong encouragement to take hold of the hope set before us. 19 This hope we have as an anchor of the soul, a hope both sure and steadfast and one which enters within the veil.” God made us promises so that we could have an anchor for our souls. (6:20) “Where Jesus has entered as a forerunner for us, having become a high priest forever according to the order of Melchizedek.” The author now returns to the topic he started in chapter 5: how Jesus fulfills the requirements for being our high priest. (7:1) “For this Melchizedek, king of Salem…” Melchizedek was the king of Salem (later renamed Jerusalem). “…priest of the Most High God…” Melchizedek was a priest 500 years before the Levitical priesthood was instituted. “…who met Abraham as he was returning from the slaughter of the kings and blessed him.” This is all recorded in Genesis 14:17-20. (7:2) “to whom also Abraham apportioned a tenth part of all the spoils…” Abraham tithed to Melchizedek. This shows that Melchizedek was the greater, and Abraham was the lesser in spiritual authority. This would be very odd to read as a Jewish believer, because Abraham was considered the father of Judaism. Here, Abraham is shown giving deference to Melchizedek, rather than the other way around. “…was first of all, by the translation of his name, king of righteousness, and then also king of Salem, which is king of peace.” Melchizedek’s name literally means “king” (Melchi) or “righteousness” (zadok). (7:3) “Without father, without mother, without genealogy, having neither beginning of days nor end of life, but made like the Son of God, he remains a priest perpetually.” The point here seems to be that Melchizedek was called a high-level priest—even though he didn’t have the genealogy to back it up. It was just stated by God in the Torah. (7:4) “Now observe how great this man was to whom Abraham, the patriarch, gave a tenth of the choicest spoils.” See comments on verse 2. (7:5) “And those indeed of the sons of Levi who receive the priest’s office have commandment in the Law to collect a tenth from the people, that is, from their brethren, although these are descended from Abraham. 6 But the one whose genealogy is not traced from them collected a tenth from Abraham and blessed the one who had the promises.” The Levitical priests collected a tithe from Abraham’s descendants, but Melchizedek collected a tithe from Abraham himself. If the Levitical priests had authority to collect money from Abraham’s descendants, then how much more authority did Melchizedek have over Abraham? (7:7) “But without any dispute the lesser is blessed by the greater.” In the military, you can discern a person’s rank by who salutes first. Similarly, in the ancient world, you could discern a person’s authority by who gave out blessings. This shows that Melchizedek had a greater spiritual stature than Abraham. (7:8-10) “In this case mortal men receive tithes, but in that case one receives them, of whom it is witnessed that he lives on. 9 And, so to speak, through Abraham even Levi, who received tithes, paid tithes. 10 For he was still in the loins of his father when Melchizedek met him.” Since the Levitical priesthood came from Abraham, it was as though this entire priesthood was submitting to Melchizedek’s authority. (7:11) “Now if perfection was through the Levitical priesthood (for on the basis of it the people received the Law), what further need was there for another priest to arise according to the order of Melchizedek, and not be designated according to the order of Aaron?” The Levitical priesthood was not an end in itself. Even the OT Scriptures point to a greater priesthood—both in the past (Gen. 14:17-20) and in the future (Ps. 110:1-4). (7:12) “For when the priesthood is changed, of necessity there takes place a change of law also.” The priesthood and the Law are all tied together. (7:13-14) “For the one concerning whom these things are spoken belongs to another tribe, from which no one has officiated at the altar. 14 For it is evident that our Lord was descended from Judah, a tribe with reference to which Moses spoke nothing concerning priests.” The Law said nothing about priests coming from the tribe a Judah, which was a kingly tribe—not a priestly one. How then can Jesus be considered a priest, if he was from the tribe of Judah? (7:15-17) “And this is clearer still, if another priest arises according to the likeness of Melchizedek, 16 who has become such not on the basis of a law of physical requirement, but according to the power of an indestructible life. 17 For it is attested of Him, ‘You are a priest forever according to the order of Melchizedek.’” Here, the author makes the connection between the Messiah and the high priest: Psalm 110 states that the Messiah would be a priest! (7:18-19) “For, on the one hand, there is a setting aside of a former commandment because of its weakness and uselessness. 19 (for the Law made nothing perfect), and on the other hand there is a bringing in of a better hope, through which we draw near to God.” So far, this discussion has seemed esoteric, but the author really drills down into the practical application. If Jesus is both a king and a priest, then this abrogates the function of the OT Law. We are not under law, under the ceremonial requirements, or civil requirements of the OT. Note the language regarding the Law: “weak” and “useless” and “made nothing perfect.” This is a major difficulty for those who think that the Law is a means of growth for Christians. (7:20-21) “And inasmuch as it was not without an oath. 21 (for they indeed became priests without an oath, but He with an oath through the One who said to Him, ‘The Lord has sworn and will not change His mind, ‘You are a priest forever’”).” The author makes a further case for the prominence of Melchizedek over and against the Levitical priests: The Levitical priests gained their priesthood through their heritage, but the Messiah gained his through a direct oath from God. (7:22) “So much the more also Jesus has become the guarantee of a better covenant.” The old covenant is the Law, and Jesus has inaugurated a new covenant. (7:23-24) “The former priests, on the one hand, existed in greater numbers because they were prevented by death from continuing. 24 But Jesus, on the other hand, because He continues forever, holds His priesthood permanently.” Here is a further contrast: The Levitical priests die off every generation, but Jesus lives on forever. (7:25) “Therefore He is able also to save forever those who draw near to God through Him, since He always lives to make intercession for them.” Our priest cannot die. Therefore, he always lives to intercede for us. (7:26) “For it was fitting for us to have such a high priest, holy, innocent, undefiled, separated from sinners and exalted above the heavens.” Here is a further distinction: The Levitical priests were sinful, while Jesus is sinless. This only further shows Jesus’ superiority as a priest. (7:27) “Who does not need daily, like those high priests, to offer up sacrifices, first for His own sins and then for the sins of the people, because this He did once for all when He offered up Himself.” The Levitical priests had to offer up sacrifices continually, but Jesus offered his one sacrifice permanently. (7:28) “For the Law appoints men as high priests who are weak, but the word of the oath, which came after the Law, appoints a Son, made perfect forever.” Do you want weakness or perfection? Why might people prefer going to a human priest to connect with God, rather than directly to God himself? Doesn’t this picture of a direct relationship with God seem more preferable? Why would people prefer a mediator of some kind instead? How would you respond to a person who said, “I know that Jesus is the only high priest, but I feel closer to God when I meet with a mediator or priest of some kind”? (8:1-2) “Now the main point in what has been said is this: we have such a high priest, who has taken His seat at the right hand of the throne of the Majesty in the heavens, 2 a minister in the sanctuary and in the true tabernacle, which the Lord pitched, not man.” After explaining the validity of Jesus’ priesthood, the author expands on the implications of Jesus’ priesthood. Priests would enter into the tabernacle of the Temple to meet with God, but Jesus went directly into heaven! This is the difference between getting a letter from the President and staying the night in the White House. (8:3) “For every high priest is appointed to offer both gifts and sacrifices; so it is necessary that this high priest also have something to offer.” It was necessary for the high priests to offer sacrifices (cf. Heb. 5:1). What did Christ offer? He offered his own life. (8:4) “Now if He were on earth, He would not be a priest at all, since there are those who offer the gifts according to the Law.” Jesus never performed any priestly sacrifice on Earth. Why not? He performed this work in heaven—in the true tabernacle and in the presence of God. (8:5) “Who serve a copy and shadow of the heavenly things, just as Moses was warned by God when he was about to erect the tabernacle; for, ‘See,’ He says, ‘that you make all things according to the pattern which was shown you on the mountain.’” The author cites Exodus 25:40. Is there a tabernacle with physical dimensions in heaven? It doesn’t seem that this is the concept the author has in mind. He doesn’t say that the tabernacle is an exact copy of some heavenly structure. The term “copy” (hypodegmati) means “an example of behavior used for purposes of moral instruction, example, model, pattern… an indication of something that appears at a subsequent time, outline, sketch, symbol” (BDAG). The author uses the same language of a “shadow” to refer to the Law prefiguring Christ (Heb. 10:1), and Paul writes that the OT festivals were a “shadow” of Christ (Col. 2:16-17). In each of these cases, the idea is not a one-to-one correspondence, but rather that these are symbolic representations of Christ’s work. (8:6) “But now He has obtained a more excellent ministry, by as much as He is also the mediator of a better covenant, which has been enacted on better promises.” Because Jesus is a better priest, he has also brought a better covenant. This may shock Christians to read, but the author is saying that the old covenant law has been fulfilled and replaced by the finished work of Christ. Just as the sacrifices and rituals have been fulfilled, so has God’s law (Mt. 5:17). (8:7) “For if that first covenant had been faultless, there would have been no occasion sought for a second.” The Jewish-Christian audience would have wondered how the Cross could replace the Law. The author cites the OT itself to prove his point. That is, the OT explains that the Law was never supposed to be God’s permanent covenant with his people. (8:8) “For finding fault with them, He says, ‘Behold, days are coming, says the Lord, when I will effect a new covenant with the house of Israel and with the house of Judah.” This is a citation of Jeremiah 31:31-34. Theologians debate if this has been completely fulfilled in Jesus. After all, the primary audience for the new covenant is “the house of Israel and the house of Judah.” In our estimation, this doesn’t only or exclusively refer to Israel, but also for the nations. This could be an example of the negative-inference fallacy (i.e. just because one thing is mentioned, this doesn’t mean that it is the only thing mentioned). At the same time, it seems that Israel is primarily in view, and the Church inherits the fruits of this covenant in the Church Age. (8:9) “Not like the covenant which I made with their fathers on the day when I took them by the hand to lead them out of the land of Egypt; for they did not continue in My covenant, and I did not care for them, says the Lord.” The covenant that the author has in mind is clearly the Mosaic Covenant—not the Abrahamic or Davidic Covenants. We know this because Jeremiah connects this covenant with the exodus (“…when I took them by the hand to lead them out of the land of Egypt…”). (8:10) “For this is the covenant that I will make with the house of Israel after those days, says the Lord: I will put My laws into their minds, and I will write them on their hearts. And I will be their God, and they shall be My people.” This new covenant is different because God’s Law used to be written on stone. Here it is written directly on the hearts of the people. (8:11) “And they shall not teach everyone his fellow citizen, and everyone his brother, saying, ‘Know the Lord,’ for all will know Me, from the least to the greatest of them.” This portion of the prophecy won’t be fulfilled until the Millennial Kingdom. 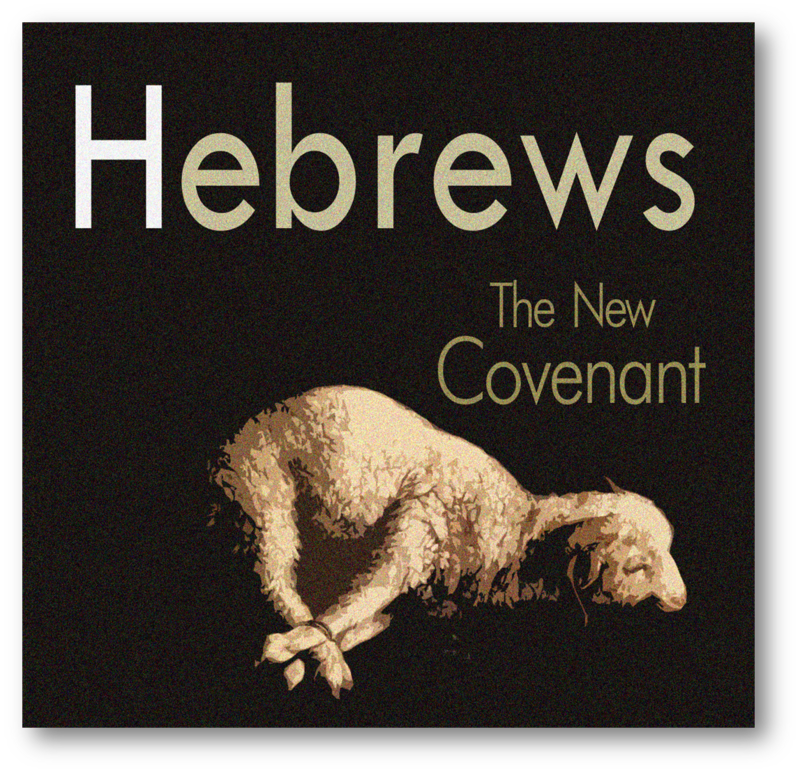 This is evidence that the author of Hebrews is not claiming that the new covenant is completely fulfilled, but only partially fulfilled. Or perhaps, more accurately, it is being fulfilled throughout the Church Age, culminating in the Millennial Kingdom. (8:13) “When He said, ‘A new covenant,’ He has made the first obsolete. But whatever is becoming obsolete and growing old is ready to disappear.” This is the longest single citation of the OT in the NT. He cites from Jeremiah 31:31ff to show that the OT itself predicts a day when the Law would be superseded by a new covenant. (8:13) Is the author of Hebrews claiming that the Church fulfilled this promise to Israel? In the Bible, God always established his promises with a sacrifice of some kind. If Jesus brought about the new covenant, then we would expect an even greater sacrifice. In fact, this is exactly what we find: Jesus’ death on the Cross inaugurated the new covenant for believers. To explain this, the author compares Jesus’ finished work with that of the old covenant high priest. (9:1) “Now even the first covenant had regulations of divine worship and the earthly sanctuary.” In order to understand this chapter, we need to be familiar with the old covenant tabernacle and worship. The author explains that the tabernacle prefigured and foreshadowed the finished work of Christ (see comments Exodus 25:10-22). (9:2) “For there was a tabernacle prepared, the outer one, in which were the lampstand and the table and the sacred bread; this is called the holy place.” There were two sections of the tabernacle. In the outer section, many of the priests could enter to offer sacrifices. But what about the inner section…? (9:3) “Behind the second veil there was a tabernacle which is called the Holy of Holies.” In the inner section, only the high priest could enter and only once a year (on Yom Kippur). (9:4) “Having a golden altar of incense and the ark of the covenant covered on all sides with gold, in which was a golden jar holding the manna, and Aaron’s rod which budded, and the tables of the covenant.” In the Holy of Holies, God kept three articles of evidence that showed how the people had rebelled against his leadership: (1) the manna representing God’s provision, (2) Aaron’s budded rod representing God’s leadership, and (3) the tablets of the Law representing God’s moral will. In each of these examples, the people rejected God’s leadership. As the angels looked down from above (v.5), they must have wondered how God would deal with the sins of the people. God’s solution? An innocent substitute needed to die and shed its blood. (9:5) “And above it were the cherubim of glory overshadowing the mercy seat; but of these things we cannot now speak in detail.” As the high priest offered the blood of an innocent sacrifice over the lid of the Ark, the angels would peer down and see the blood covering the rebellion of the people. Therefore, instead of seeing the rebellion of the people within the Ark, the angels would see the blood of an innocent substitute—in this case, an innocent animal. (9:6) “Now when these things have been so prepared, the priests are continually entering the outer tabernacle performing the divine worship.” The priests needed to perform these sacrifices over and over and over. Hundreds of thousands of animals were sacrificed over the years. But what did it all mean? (9:7) “But into the second [i.e. the Holy of Holies], only the high priest enters once a year, not without taking blood, which he offers for himself and for the sins of the people committed in ignorance.” By contrast, the high priest would only offer one sacrifice per year for the sins of the people. What is the purpose of this history lesson? The author ties this all together in the following verses—namely, all of this prefigured and foreshadowed the work of Christ. When God looked down at the rebellion of humanity, he chose to offer a sacrifice of an innocent substitute, who would pay for sin. (9:8-10) “The Holy Spirit is signifying this, that the way into the holy place has not yet been disclosed while the outer tabernacle is still standing, 9 which is a symbol for the present time. Accordingly both gifts and sacrifices are offered which cannot make the worshiper perfect in conscience, 10 since they relate only to food and drink and various washings, regulations for the body imposed until a time of reformation.” Of course, the rituals of the old covenant couldn’t really pay for sin. These were symbols of the future work of Christ. (9:11-14) “But when Christ appeared as a high priest of the good things to come, He entered through the greater and more perfect tabernacle, not made with hands, that is to say, not of this creation; 12 and not through the blood of goats and calves, but through His own blood, He entered the holy place once for all, having obtained eternal redemption. 13 For if the blood of goats and bulls and the ashes of a heifer sprinkling those who have been defiled sanctify for the cleansing of the flesh, 14 how much more will the blood of Christ, who through the eternal Spirit offered Himself without blemish to God, cleanse your conscience from dead works to serve the living God?” The author makes an a fortiori argument: If the blood of bulls and goats could clean us ceremonially, how much more does the blood of God forgive our sins and cleanse our conscience? (9:15) “For this reason He is the mediator of a new covenant, so that, since a death has taken place for the redemption of the transgressions that were committed under the first covenant, those who have been called may receive the promise of the eternal inheritance.” Covenants need a death to be ratified. This covenant was made with the blood of Jesus—God made flesh. (9:16-17) “For where a covenant is, there must of necessity be the death of the one who made it. 17 For a covenant is valid only when men are dead, for it is never in force while the one who made it lives.” Consider when someone writes a “will” for how their property is to be divvied up after death. Once the person dies, you can’t argue with the lawyer who is reading the will. Similarly, since Jesus is dead, we can’t argue with his finished work for us and change his covenant. (9:18-22) “Therefore even the first covenant was not inaugurated without blood. 19 For when every commandment had been spoken by Moses to all the people according to the Law, he took the blood of the calves and the goats, with water and scarlet wool and hyssop, and sprinkled both the book itself and all the people, 20 saying, ‘This is the blood of the covenant which God commanded you.’ 21 And in the same way he sprinkled both the tabernacle and all the vessels of the ministry with the blood. 22 And according to the Law, one may almost say, all things are cleansed with blood, and without shedding of blood there is no forgiveness.” The author compares this concept with the old covenant. He cites the example of Moses sprinkling blood over the people to seal the covenant of the Law (Ex. 24:8). (9:22) Was blood sacrifice really necessary? (9:23) “Therefore it was necessary for the copies of the things in the heavens to be cleansed with these, but the heavenly things themselves with better sacrifices than these.” If we want the true tabernacle of heaven to be cleansed, we need the Man from heaven to cleanse it. (9:24) “For Christ did not enter a holy place made with hands, a mere copy of the true one, but into heaven itself, now to appear in the presence of God for us.” We needed a spiritual solution to our problem, which Christ fulfilled. (9:25) “Nor was it that He would offer Himself often, as the high priest enters the holy place year by year with blood that is not his own.” The priests offered sacrifices over and over, but Christ’ sacrifice is complete. (9:26) “Otherwise, He would have needed to suffer often since the foundation of the world; but now once at the consummation of the ages He has been manifested to put away sin by the sacrifice of Himself.” Jesus didn’t need to die over and over. He died “once for all” (9:12). (9:27-28) “And inasmuch as it is appointed for men to die once and after this comes judgment, 28 so Christ also, having been offered once to bear the sins of many, will appear a second time for salvation without reference to sin, to those who eagerly await Him.” Humans only die once and then judgment is served. Likewise, Christ only died once, and his death is sufficient to pay for our judgment. When he returns at his second coming, we won’t suffer or sacrifice himself. He’ll return to judge the Earth. Most religions have “holy spaces,” but biblical Christianity denies this. Why do you think people prefer to have holy spaces? Isn’t the biblical picture more preferable? Why wouldn’t people prefer the biblical view? What would say to someone who claimed, “I know that the Bible doesn’t teach we should have holy spaces, but I just feel closer to God in a church or sanctuary”? (see “Omnipresence”). (10:1-3) “For the Law, since it has only a shadow of the good things to come and not the very form of things, can never, by the same sacrifices which they offer continually year by year, make perfect those who draw near. 2 Otherwise, would they not have ceased to be offered, because the worshipers, having once been cleansed, would no longer have had consciousness of sins? 3 But in those sacrifices there is a reminder of sins year by year.” Why isn’t the Law helpful for spiritual growth? His argument points the repetition of the sacrifices. If the Law could cure the disease, why do we need to return to it so frequently? The Law is a reminder of sin, but not a removal of sin (v.3). It helped in identifying our condition, but not giving us a cure. (10:4) “For it is impossible for the blood of bulls and goats to take away sins.” These sacrifices were symbolic. Christianity only has two rituals: baptism and the Lord’s Supper. One of these we only do once (baptism), so it’s practically only one ritual (the Lord’s Supper). Even with this ritual, Paul gives no mention of where, when, or how often we should practice this. He writes, “As often as you eat this bread and drink the cup” (1 Cor. 11:26). Other religions have extensive rituals: Why might people prefer ritualism to such a personal relationship with God? (10:5-9) “Therefore, when He comes into the world, He says, ‘Sacrifice and offering You have not desired, but a body You have prepared for Me; 6 In whole burnt offerings and sacrifices for sin You have taken no pleasure. 7 ‘Then I said, ‘Behold, I have come (in the scroll of the book it is written of Me) to do Your will, O God.’” 8 After saying above, ‘Sacrifices and offerings and whole burnt offerings and sacrifices for sin You have not desired, nor have You taken pleasure in them’ (which are offered according to the Law), 9 then He said, ‘Behold, I have come to do Your will.’ He takes away the first in order to establish the second.” The author quotes Psalm 40:6-8 to argue for the supremacy of Christ’s sacrifice over the sacrifices of animals. The people were raising up the sacrificial system over God’s greater priority. By quoting Psalm 40, the author shows that even in the old covenant God predicted an internalized understanding of the Law and valued obedience over sacrifices. Since Jesus was perfectly obedient, he paid for the ultimate sacrifice on our behalf. For an explanation of why he quotes Psalm 40, see comments on Hebrews 10:5. (10:11-13) “Every priest stands daily ministering and offering time after time the same sacrifices, which can never take away sins; 12 but He, having offered one sacrifice for sins for all time, sat down at the right hand of God, 13 waiting from that time onward until His enemies be made a footstool for His feet.” He’s already established Jesus’ priesthood with Psalm 110, so he notes that the Messiah would sit and rest after his work. If Jesus has rested after the Cross never to die again, this implies that his sacrifice was completed. Christ’s sacrifice is different from the old covenant sacrifices because it was only needed once. (10:14) “For by one offering He has perfected for all time those who are sanctified.” The author personalizes Christ’s work here. In verse 10, it was his sacrifice. Here it is Jesus himself who saves. “Sanctified” (hagiazomenous) can also be rendered “those being sanctified” (see NASB note). Morris comments, “[This translation] is not likely to be correct because, as we have noticed, the idea of sanctification as a continuing process does not seem to appear in Hebrews.” Morris concludes that it can refer to a timeless setting apart of all people, or that more and more people are coming to Christ and being set apart. Either way it refers to the community of faith being set apart—not to spiritual growth for the individual believer. (10:15-18) “And the Holy Spirit also testifies to us; for after saying, 16 ‘This is the covenant that I will make with them after those days, says the Lord: I will put My laws upon their heart, and on their mind I will write them,’ He then says, 17 ‘And their sins and their lawless deeds I will remember no more.’ 18 Now where there is forgiveness of these things, there is no longer any offering for sin.” He returns to Jeremiah 31 to explain that the sacrifice has been paid, sins are forgiven, and we have no need to offer sacrifices anymore. (10:19-21) “Therefore, brethren, since we have confidence to enter the holy place by the blood of Jesus, 20 by a new and living way which He inaugurated for us through the veil, that is, His flesh, 21 and since we have a great priest over the house of God.” The author combines all of the themes that he’s been arguing so far. The Holy of Holies, the veil, and the high priesthood all foreshadowed Christ. In case we think he’s just referring to abstract theology, the author hits us with the consequences of all of this. (10:22) “Let us draw near with a sincere heart in full assurance of faith, having our hearts sprinkled clean from an evil conscience and our bodies washed with pure water.” In the Greek, the order of the words shows emphasis. Here the term “draw near” comes at the start of the sentence, showing its importance. Because of the work of Christ, we are able to come into God’s presence. While in the old covenant, it was only the high priest and only once a year and only after innumerable rituals—now all believers in Christ have this access. (10:23) “Let us hold fast the confession of our hope without wavering, for He who promised is faithful.” Because Christ is faithful in his work, we should express personal trust in him. Have you decided in advance to pursue Christ even when it is not exciting or even painful? Have you decided in advance to put the cause of Christ above all else? (10:24) “And let us consider how to stimulate one another to love and good deeds.” The imperative of this verse is not to stimulate, but to consider how to stimulate others. The term “consider” (katanoomen) means “to notice, observe, to look at in a reflective manner, consider, contemplate, to think about carefully, envisage, think about” (BDAG). “Stimulate” (paroxysmon) is the root from which we get our medical term “paroxysm.” It means “rousing to activity, stirring up, provoking” or “a state of irritation expressed in argument, sharp disagreement” or “a severe fit of a disease, attack of fever, especially at its high point: convulsion” (BDAG). (10:25) “Not forsaking our own assembling together, as is the habit of some, but encouraging one another; and all the more as you see the day drawing near.” It’s a moral imperative to meet together with other believers in fellowship. (10:26-31) Does this passage teach that we can lose our salvation from willful sin? (10:32-34) “But remember the former days, when, after being enlightened, you endured a great conflict of sufferings, 33 partly by being made a public spectacle through reproaches and tribulations, and partly by becoming sharers with those who were so treated. 34 For you showed sympathy to the prisoners and accepted joyfully the seizure of your property, knowing that you have for yourselves a better possession and a lasting one.” These believers had gone through persecution and suffering. They were either persecuted themselves, or they suffered alongside those who were persecuted (cf. Heb. 13:3). (10:35-36) “Therefore, do not throw away your confidence, which has a great reward. 36 For you have need of endurance, so that when you have done the will of God, you may receive what was promised.” The issue with our endurance is our “reward” in being faithful. (10:37-38) “For yet in a very little while, He who is coming will come, and will not delay. 38 But My righteous one shall live by faith; and if he shrinks back, My soul has no pleasure in him.” The author cites Habakkuk 2:4. (10:39) “But we are not of those who shrink back to destruction, but of those who have faith to the preserving of the soul.” Is this perseverance of the saints? It might relate to our “reward” (v.35). Salvation is never viewed as a reward; it’s always used as a gift. Read through verses 22-25: What are the keys to spiritual growth mentioned in this passage? Based on verse 22: What are some key ways to making our personal time with God thrive? Based on verse 24: How can we prepare to stimulate one another for love and good deeds before a time of fellowship or discipleship? Based on verse 25: Why do you think the author places such a high value on the importance of Christian fellowship? What might we miss out on if we neglect fellowship with other Christians? (11:1) “Now faith is the assurance of things hoped for, the conviction of things not seen.” This is the best single definition of faith in the Bible. (11:2) “For by it the men of old gained approval.” Most translations do not capture the translation of “gained approval” (martyreo). The term literally means “witness,” as in Hebrews 12:1. This is important in interpreting this chapter. Namely, the author is showing that God showed up to “give approval” or to “witness” when OT saints exerted faith. In the old covenant, the basis for our relationship with God was faith—just as it is today in the new covenant. As you read through this chapter, note that the author doesn’t point to the heroes of the OT because of their works, but because of their faith. In the following verses, the author moves through the OT to show various examples of biblical faith. (11:3) “By faith we understand that the worlds were prepared by the word of God, so that what is seen was not made out of things which are visible.” The “seen” is the material universe, but the “unseen” was the omnipotent power of God. The surrounding worldviews believed that the universe was eternal, while the Bible said it had a beginning. Since this wasn’t open to direct observation, we need to exert trust in the Bible’s teaching on this topic. Incidentally, today, we know that the universe did have a space-time beginning at the Big Bang—a view which was held by the Judeo-Christian tradition for millennia before its discovery. (11:4) “By faith Abel offered to God a better sacrifice than Cain, through which he obtained the testimony that he was righteous, God testifying about his gifts, and through faith, though he is dead, he still speaks.” Abel brought the “firstlings” of his flock, while Cain simply brought “an offering.” Hartley writes, “These terms convey that Abel gave the best to God.” John states that the reason Cain killed Abel was “because his deeds were evil, and his brother’s were righteous” (1 Jn. 3:12). Cain was coming to God on his own terms—not God’s terms. Cain’s offering is similar to false worship of God today. People outwardly look religious, giving their offering to God. Yet inwardly, they are giving him the leftovers—not an act of faith. God sees the heart—not just the offering or actions. We can’t bank on God rescuing us from death. In the previous verse, faith led to Abel being murdered, while in this verse, Enoch’s faith led him to being spared. (11:6) “And without faith it is impossible to please Him, for he who comes to God must believe that He is and that He is a rewarder of those who seek Him.” This verse really unpacks the implications of verse 1. Two central concepts explain core biblical faith: (1) God exists and (2) God is loving. Or we might say: (1) God is God and (2) God is Good. (11:7) “By faith Noah, being warned by God about things not yet seen, in reverence prepared an ark for the salvation of his household, by which he condemned the world, and became an heir of the righteousness which is according to faith.” Noah couldn’t see the judgment of God on the proverbial horizon. He built a massive cruise liner in the middle of the desert on the basis that God’s word was trustworthy. The “seen” was God’s promise of judgment, but the “unseen” was the coming Flood. As the people were chastising Noah for decades, he probably experienced doubt. But when the rain came and the door to the Ark closed, his faith was validated. The same is true of biblical faith for us. We can’t directly verifying everything in the word, but we are called to express trust in the unseen promises that will be fulfilled. (11:8-10) “By faith Abraham, when he was called, obeyed by going out to a place which he was to receive for an inheritance; and he went out, not knowing where he was going. 9 By faith he lived as an alien in the land of promise, as in a foreign land, dwelling in tents with Isaac and Jacob, fellow heirs of the same promise; 10 for he was looking for the city which has foundations, whose architect and builder is God.” Abraham lived in Ur of the Chaldeans as a Pagan, until God called him to leave. The “seen” was the covenant given to Abraham, but the “unseen” was the expansion of his descendants hundreds of years later. While Abraham couldn’t see the fulfillment of God’s promise to him, he believed that God was trustworthy. He never saw the outcome of his faith (the inheritance of the Promised Land). In fact, God told him that his ancestors wouldn’t inherit the land for over 400 years (Gen. 15:13-16). (11:11) “By faith even Sarah herself received ability to conceive, even beyond the proper time of life, since she considered Him faithful who had promised.” God promised Sarah (an elderly woman) a son—even though she was long past child-bearing years. The “seen” was God’s promise to her, but the “unseen” was the birth of a child in the future. (11:12-16) “Therefore there was born even of one man, and him as good as dead at that, as many descendants as the stars of heaven in number, and innumerable as the sand which is by the seashore. 13 All these died in faith, without receiving the promises, but having seen them and having welcomed them from a distance, and having confessed that they were strangers and exiles on the earth. 14 For those who say such things make it clear that they are seeking a country of their own. 15 And indeed if they had been thinking of that country from which they went out, they would have had opportunity to return. 16 But as it is, they desire a better country, that is, a heavenly one. Therefore God is not ashamed to be called their God; for He has prepared a city for them.” Abraham’s descendants experienced the miraculous gift of being multiplied (the “seen”), but they didn’t experienced the ultimate fulfillment of the promise of the land (the “unseen”) and ultimately heaven (vv.14-16). (11:17-19) “By faith Abraham, when he was tested, offered up Isaac, and he who had received the promises was offering up his only begotten son; 18 it was he to whom it was said, ‘In Isaac your descendants shall be called.’ 19 He considered that God is able to raise people even from the dead, from which he also received him back as a type.” The author offers a second example of faith in the life of Abraham. After decades of waiting on an heir, God delivered Isaac. Yet, years later, God called on Abraham to sacrifice Isaac! See comments on Genesis 22. The “seen” part was God’s promise to make Abraham a father of many nations (v.12, 18). The “unseen” part was how God would carry out this promise. As it turns out, God stopped Abraham from carrying out the sacrifice, but Abraham trusted that God would raise the boy from the dead (v.19). (11:20) “By faith Isaac blessed Jacob and Esau, even regarding things to come.” How does the “seen” and “unseen” motif carry out in the life of Isaac? It might be that Isaac literally couldn’t see Jacob as he was deceived, but rather, he blessed the boy in front of him. We’re not sure. (11:21) “By faith Jacob, as he was dying, blessed each of the sons of Joseph, and worshiped, leaning on the top of his staff.” Jacob blessed all of his sons before he died (Gen. 49). The “seen” was his sons, but the “unseen” was the results of his promise. He couldn’t see what would happen to his sons. (11:22) “By faith Joseph, when he was dying, made mention of the exodus of the sons of Israel, and gave orders concerning his bones.” Joseph became a highly influential man in Egypt—second only to the Pharaoh. It would’ve been tempting for him to want to lay his roots down in Egypt, seeing as how he had built such a great life there. The “seen” was Egypt’s wealth and prosperity, but the “unseen” was the promise of the Exodus. This is why Joseph made his descendants promise to take his bones with them to be buried in Israel. He knew that the ultimate goal was not Egypt, but Israel. (11:23) “By faith Moses, when he was born, was hidden for three months by his parents, because they saw he was a beautiful child; and they were not afraid of the king’s edict.” The “seen” for Moses’ parents was the evil edict of the Pharaoh. The “unseen” was the love of the child and the plan of God which carried priority. (11:24-26) “By faith Moses, when he had grown up, refused to be called the son of Pharaoh’s daughter, 25 choosing rather to endure ill-treatment with the people of God than to enjoy the passing pleasures of sin, 26 considering the reproach of Christ greater riches than the treasures of Egypt; for he was looking to the reward.” The “seen” for Moses was the court of Pharaoh and the opulence of Egypt. The “unseen” portion was the plan of God in the Exodus to rescue his people and put them in their land. (11:27) “By faith he left Egypt, not fearing the wrath of the king; for he endured, as seeing Him who is unseen.” The “seen” was the evil, tyrannical Pharaoh. The “unseen” was the Cosmic King Yahweh. He chose to serve the latter over the former. (11:28) “By faith he kept the Passover and the sprinkling of the blood, so that he who destroyed the firstborn would not touch them.” The “seen” was the angel of judgment coming to claim the lives of the firstborn. The “unseen” was the promise of the sacrificial lamb’s blood. When they placed the blood over the lintel, they probably didn’t feel like this protected them from judgment, but in reality it did (Ex. 12). (11:29) “By faith they passed through the Red Sea as though they were passing through dry land; and the Egyptians, when they attempted it, were drowned.” As they had their backs to the Red Sea (Ex. 14), the “seen” was the greatest army known to man, coming to kill the Israelites. The “unseen” portion was the promise that God would (somehow) rescue his people. (11:30) “By faith the walls of Jericho fell down after they had been encircled for seven days.” The Jewish people must have felt pretty silly circling the walls of Jericho several times. The “seen” was the sneering and intimidating of the soldiers in Jericho, while the “unseen” was the power of God to topple the walls. (11:31) “By faith Rahab the harlot did not perish along with those who were disobedient, after she had welcomed the spies in peace.” The “seen” for Rahab was the threat of the Canaanite army, who would likely torture and murder a traitor for hiding the spies (Josh. 2). (11:32-40) “And what more shall I say? For time will fail me if I tell of Gideon, Barak, Samson, Jephthah, of David and Samuel and the prophets, 33 who by faith conquered kingdoms, performed acts of righteousness, obtained promises, shut the mouths of lions, 34 quenched the power of fire, escaped the edge of the sword, from weakness were made strong, became mighty in war, put foreign armies to flight. 35 Women received back their dead by resurrection; and others were tortured, not accepting their release, so that they might obtain a better resurrection; 36 and others experienced mockings and scourgings, yes, also chains and imprisonment. 37 They were stoned, they were sawn in two, they were tempted, they were put to death with the sword; they went about in sheepskins, in goatskins, being destitute, afflicted, ill-treated 38 (men of whom the world was not worthy), wandering in deserts and mountains and caves and holes in the ground. 39 And all these, having gained approval through their faith, did not receive what was promised, 40 because God had provided something better for us, so that apart from us they would not be made perfect.” At this point, the author moves rapid fire through a list of people who had similar faith, trusting in the “unseen” spiritual reality rather than the “seen” reality. (12:1) “Therefore, since we have so great a cloud of witnesses surrounding us…” The “cloud of witnesses” refers to the OT saints in the previous chapters. It isn’t that they witness us. It’s that they were witnesses of God showing up when they displayed faith. They witness to us about how God operates. “…let us also lay aside every encumbrance and the sin which so easily entangles us, and let us run with endurance the race that is set before us.” Like a long distance runner, we are supposed to throw off two things: (1) any “encumbrance” and (2) any “sin.” Obviously, sin issues will affect our ability to run the race to the end, but he also adds morally neutral activities (“any encumbrance”). Sometimes in your walk with Christ, you will discover areas that aren’t immoral, but they aren’t as satisfying or consistent with putting the race first. The illustration is a runner showing up to the race wearing an 80 pound backpack and a wool sweater. This isn’t wrong, but it’s going to affect him running. We often don’t need to choose between the good and the bad, but the better and the best. The fact that the author mentions “endurance” means that our Christian walk needs to be accompanied with patience over the long haul. Some runners who start off well will not finish well. Note that this is a race we run together (“let us run…”). (12:2) “Fixing our eyes on Jesus, the author and perfecter of faith, who for the joy set before Him endured the cross, despising the shame, and has sat down at the right hand of the throne of God.” The term “fix our eyes” (aphorontes) means (1) “to direct one’s attention without distraction” or (2) “to develop more precise knowledge about something” (BDAG). Consider the mental focus needed for running a long distance marathon. Most of the battle is in our mind. What was the joy set before Jesus? Was the joy the Cross? No, he was tortured and butchered like an animal there. He had to “endure” the Cross… That can’t be it. Was it going to heaven? No, because if that was it, then he would’ve just stayed in Heaven in the first place. Don’t you see what the “joy” was? It was you! He was willing to have the Cross, just so he could have you. Likewise, Paul writes, “What we suffer now is nothing compared to the glory he will reveal to us later” (Rom. 8:18). (12:3) “For consider Him who has endured such hostility by sinners against Himself, so that you will not grow weary and lose heart.” We’re supposed to focus on the Cross during times of suffering. It’s only as we think of God’s love (and suffering) for us that we’re able to handle our suffering. (12:5-6) “And you have forgotten the exhortation which is addressed to you as sons, ‘My son, do not regard lightly the discipline of the Lord, nor faint when you are reproved by Him; 6 For those whom the Lord loves He disciplines, and He scourges every son whom He receives.” They had forgotten the word of encouragement because they had grown dull (cf. Heb. 5:11-14). He quotes Proverbs 3:11-12. God disciplines us through his love. (12:7) “It is for discipline that you endure; God deals with you as with sons; for what son is there whom his father does not discipline?” Our culture doesn’t believe in disciplining our children like they have in other cultures. The reason for discipline is that we believe human nature is inherently rebellious and we need corrected. (12:8) “But if you are without discipline, of which all have become partakers, then you are illegitimate children and not sons.” We discipline our own children—not other people’s children. If we didn’t experience discipline from God, what would this imply? That we’re not his children. (12:9-10) “Furthermore, we had earthly fathers to discipline us, and we respected them; shall we not much rather be subject to the Father of spirits, and live? 10 For they disciplined us for a short time as seemed best to them, but He disciplines us for our good, so that we may share His holiness.” The discipline from our parents was not perfect, but God’s is. (12:11) “All discipline for the moment seems not to be joyful, but sorrowful; yet to those who have been trained by it, afterwards it yields the peaceful fruit of righteousness.” The author has a realistic view of suffering. He knows that it is painful and sorrowful. But this is the training that no other means of growth provides. (12:12-13) “Therefore, strengthen the hands that are weak and the knees that are feeble, 13 and make straight paths for your feet, so that the limb which is lame may not be put out of joint, but rather be healed.” Ancient doctors needed to snap a bone back into place in order to set it. This was painful at first, but it resulted in a healed bone. (12:14) Will we go to hell if we are not sanctified by God? (12:15-17) Did Esau lose his salvation? We shouldn’t see Esau’s error in isolation from the rest of his life. We will each face pain, and will need to decide if we’re going to take “the bowl of soup” or if we’re going to wait on God. (12:24) “And to Jesus, the mediator of a new covenant, and to the sprinkled blood, which speaks better than the blood of Abel.” Abel’s blood cried out for judgment on Cain (Gen. 4), but Jesus’ blood cries out for mercy and forgiveness. (12:25-28) “See to it that you do not refuse Him who is speaking. For if those did not escape when they refused him who warned them on earth, much less will we escape who turn away from Him who warns from heaven. 26 And His voice shook the earth then, but now He has promised, saying, ‘Yet once more I will shake not only the earth, but also the heaven.’ 27 This expression, ‘Yet once more,’ denotes the removing of those things which can be shaken, as of created things, so that those things which cannot be shaken may remain. 28 Therefore, since we receive a kingdom which cannot be shaken, let us show gratitude, by which we may offer to God an acceptable service with reverence and awe.” He compares the shakable mountain of Sinai with the unshakable kingdom of grace. (12:29) “For our God is a consuming fire.” The word “fire” refers to God’s direction (Deut. 1:31), word (Deut. 4:12), redemption (Deut. 4:20), and exclusivity (Deut. 4:24). The author closes his letter with practical exhortations on how to serve God. DISCUSSION: Loving each other and loving non-Christians needs to be balanced. How would we know if we were moving too far in one direction or the other? (13:3) “Remember the prisoners, as though in prison with them, and those who are ill-treated, since you yourselves also are in the body.” The prisoners in this passage were Christians. Notice that the author writes, “Remember the prisoners… since you yourselves also are in the body” (v.3; cf. 10:34). That is, they were also in the “body of Christ.” Paul taught, “If one member suffers, all the members suffer with it” (1 Cor. 12:26). Earlier, the author of Hebrews wrote, “You showed sympathy to the prisoners and accepted joyfully the seizure of your property, knowing that you have for yourselves a better possession and a lasting one” (Heb. 10:34). Grammatically, this makes better sense of the text. The author refers to the plural believers (“you yourselves”) being in the singular body (“in the body”). If he was thinking in terms of being embodied, the grammar would reflect this. Semantically, the phrase ‘the body’ is used to refer to the Body of Christ. While usages of this metaphor for the church include “the body of Christ,” some usages of the metaphor simply refer to the church as “the body” (e.g. 1 Cor. 12:14, 18, 19, 22-25; Eph. 3:6; 4:16; 5:23; Col. 1:18; cf. maybe 1 Cor. 11:29). Intelligibly, this makes better sense as to why these believers should care for fellow believers. We don’t see why the author would need to remind fellow believers that they are embodied… Obviously, they have bodies! However, making an appeal to being in the Body of Christ would make much more sense regarding why we should care for the prisoners. After all, we are all one Body—whether in prison or not (1 Cor. 12:26). “As though in prison with them…” They were identifying with these prisoners to the point that they empathized with them. “Those who are ill-treated…” This harkens back to the OT saints who endured torture (Heb. 11:36-37). Cockerill writes, “The incarcerated endured great suffering because prisons were cramped, damp, dark, and filthy. Furthermore, those who kept them were often harsh and desirous of bribes. Prisoners were given no clothes and little if any food.” Later history records that believers would supplement the needs of those in prison. Timothy brought Paul’s “cloak” and “books” to him while he was in prison (2 Tim. 4:13). Earlier Paul urged Timothy, “Do not be ashamed of the testimony of our Lord or of me His prisoner, but join with me in suffering for the gospel” (2 Tim. 1:8). Lucian (the second century Greek satirist) wrote about a confessing believer named Peregrinus Proteus, who was imprisoned in Palestine. He wrote, “[The Christians] left no stone unturned in their endeavor to procure his release. When this proved impossible, they looked after his wants in all other matters with untiring solicitude and devotion. From earliest dawn old women (‘widows,’ they are called) and orphan children might be seen waiting about the prison-doors; while the officers of the church, by bribing the jailors, were able to spend the night inside with him. Meals were brought in, and they went through their sacred formulas” (The Death of Peregrinus, 12). Lucian also wrote that Demetrius of Sunium (a cynic philosopher) visited his friend in prison, bringing him food (Friendship, 31). Tertullian (AD 200): “The Church… and each brother out of his private means, makes for your bodily wants in the prison” (To the Martyrs, 1). Tertullian (AD 200): “On the monthly day, if he likes, each puts in a small donation; but only if it be his pleasure, and only if he be able: for there is no compulsion; all is voluntary. These gifts are, as it were, piety’s deposit fund. For they are not taken thence and spent on feasts, and drinking-bouts, and eating-houses, but to support and bury poor people, to supply the wants of boys and girls destitute of means and parents, and of old persons confined now to the house; such, too, as have suffered shipwreck; and if there happen to be any in the mines, or banished to the islands, or shut up in the prisons, for nothing but their fidelity to the cause of God’s Church, they become the nurslings of their confession” (Apology, 39). (13:4) “Marriage is to be held in honor among all, and the marriage bed is to be undefiled; for fornicators and adulterers God will judge.” Marriage is to be viewed with “honor.” The term timios means “pertaining to being of exceptional value,” “costly, precious,” “of great worth or value” (BDAG). God doesn’t actively strike us dead, but he lets us experience his passive wrath in neglecting his will (see “The Bible’s Sexual Position”). (13:7) “Remember those who led you, who spoke the word of God to you; and considering the result of their conduct, imitate their faith.” Our values are greatly impacted and formed by seeing the faith of quality Christian leaders in our lives. (13:8-9) “Jesus Christ is the same yesterday and today and forever. 9 Do not be carried away by varied and strange teachings; for it is good for the heart to be strengthened by grace, not by foods, through which those who were so occupied were not benefited.” God doesn’t change; therefore, Christian doctrine is timeless—not subject to culture (see “Postmodernism”). We need to teach what the Bible teaches, and emphasize what the Bible emphasizes (i.e. “strengthened by grace”). (13:10-14) “We have an altar from which those who serve the tabernacle have no right to eat. 11 For the bodies of those animals whose blood is brought into the holy place by the high priest as an offering for sin, are burned outside the camp. 12 Therefore Jesus also, that He might sanctify the people through His own blood, suffered outside the gate. 13 So, let us go out to Him outside the camp, bearing His reproach. 14 For here we do not have a lasting city, but we are seeking the city which is to come.” Just as the animals sacrifice was burned outside the camp, Jesus was crucified outside the camp. The author was imploring his audience to join Jesus outside of the Temple sacrifices, rather than succumbing to the religious pressure. (13:17) “Obey your leaders and submit to them, for they keep watch over your souls as those who will give an account. Let them do this with joy and not with grief, for this would be unprofitable for you.” Spiritual authority is taught in the Bible. It pertains only to the realm of spirituality, however. That is, spiritual authority relates to the running of the ministry—not to secular matters in a person’s life. In non-spiritual areas, leaders do not have authority, but lead only through persuasion and opinion (see “Trusting God with Big Decisions”). Guthrie, Donald. Hebrews: An Introduction and Commentary (Vol. 15). Downers Grove, IL: InterVarsity Press. 1983. 253. Lane holds to the interpretation that this is literal blood of martyrdom, but entertains both views. Lane, W. L. Hebrews 9–13 (Vol. 47B). Dallas: Word, Incorporated. 1998. 417. Stedman, Ray. Hebrews. Downers Grove, IL: InterVarsity Press. 1992. Introduction. Richards, E. Randolph. “The Codex and Early Collection of Paul’s Letters.” Bulletin for Biblical Research 8 (1998) 151-166. Guthrie, Donald. Hebrews: An Introduction and Commentary (Vol. 15, p. 19). Downers Grove, IL: InterVarsity Press. 1983. 19. Cockerill, Gareth Lee. The Epistle to the Hebrews. Grand Rapids, MI: William B. Eerdmans, 2012. 4. Geisler, Norman & Nix, William. A General Introduction to the Bible: Revised and Expanded. Chicago, IL. Moody Press. 1986. 299. Morris, Leon. Hebrews. In F. E. Gaebelein (Ed. ), The Expositor’s Bible Commentary, Volume 12: Hebrews through Revelation (F. E. Gaebelein, Ed.). Grand Rapids, MI: Zondervan Publishing House. 1981. 8. Guthrie, D. (1983). Hebrews: An Introduction and Commentary (Vol. 15, p. 67). Downers Grove, IL: InterVarsity Press. Morris, Leon. Hebrews. In F. E. Gaebelein (Ed. ), The Expositor’s Bible Commentary, Volume 12: Hebrews through Revelation (F. E. Gaebelein, Ed.). Grand Rapids, MI: Zondervan Publishing House. 1981. 13. Guthrie, D. (1983). Hebrews: An Introduction and Commentary (Vol. 15, p. 71). Downers Grove, IL: InterVarsity Press. Morris, Leon. Hebrews. In F. E. Gaebelein (Ed. ), The Expositor’s Bible Commentary, Volume 12: Hebrews through Revelation (F. E. Gaebelein, Ed.). Grand Rapids, MI: Zondervan Publishing House. 1981. 14. Beale, G. K., & Carson, D. A. (2007). Commentary on the New Testament use of the Old Testament (p. 931). Grand Rapids, MI; Nottingham, UK: Baker Academic; Apollos. Guthrie, D. (1983). Hebrews: An Introduction and Commentary (Vol. 15, p. 79). Downers Grove, IL: InterVarsity Press. Beale, G. K., & Carson, D. A. (2007). Commentary on the New Testament use of the Old Testament (p. 940). Grand Rapids, MI; Nottingham, UK: Baker Academic; Apollos. Morris, L. (1981). Hebrews. In F. E. Gaebelein (Ed. ), The Expositor’s Bible Commentary: Hebrews through Revelation (Vol. 12, p. 45). Grand Rapids, MI: Zondervan Publishing House. Morris, L. (1981). Hebrews. In F. E. Gaebelein (Ed. ), The Expositor’s Bible Commentary: Hebrews through Revelation (Vol. 12, p. 99). Grand Rapids, MI: Zondervan Publishing House. Morris, L. (1981). Hebrews. In F. E. Gaebelein (Ed. ), The Expositor’s Bible Commentary: Hebrews through Revelation (Vol. 12, p. 101). Grand Rapids, MI: Zondervan Publishing House. Hartley, John. Genesis. (W. W. Gasque, R. L. Hubbard Jr., & R. K. Johnston, Eds.). Grand Rapids, MI: Baker Books. 2012. 81. Guthrie, D. (1983). Hebrews: An Introduction and Commentary (Vol. 15, p. 231). Downers Grove, IL: InterVarsity Press. Donald Guthrie writes, “The words draw attention to the physical limitations to which all are subject.” Guthrie, D. (1983). Hebrews: An Introduction and Commentary (Vol. 15, p. 270). Downers Grove, IL: InterVarsity Press. However, the author’s point is to show deep, spiritual identification with them—not merely the similarity of being human or embodied. F.F. Bruce writes, “Those who are themselves ‘in the body’ are in a position to imagine how they would feel if the same ill-treatment were meted out to them. The phrase ‘in the body’ should not be interpreted to mean ‘in the body of Christ’ (as fellow-members).” Bruce, F. F. (1990). The Epistle to the Hebrews (Rev. ed., p. 372). Grand Rapids, MI: Wm. B. Eerdmans Publishing Co.
 Garreth Lee Cockerill writes, “This is no reference to the people of God as the ‘body’ of Christ.” See footnote in Cockerill, G. L. (2012). The Epistle to the Hebrews (p. 682). Grand Rapids, MI; Cambridge, UK: William B. Eerdmans Publishing Company. William L. Lane understands this to mean “as if you yourselves were suffering bodily.” Lane, W. L. (1998). Hebrews 9–13 (Vol. 47B, p. 515). Dallas: Word, Incorporated. Cockerill, G. L. (2012). The Epistle to the Hebrews (p. 681). Grand Rapids, MI; Cambridge, UK: William B. Eerdmans Publishing Company. Cited in Bruce, F. F. (1990). The Epistle to the Hebrews (Rev. ed., p. 372). Grand Rapids, MI: Wm. B. Eerdmans Publishing Co.
 Cited in Lane, W. L. (1998). Hebrews 9–13 (Vol. 47B, p. 514). Dallas: Word, Incorporated. Dennis McCallum, Liberation! (Columbus, OH: New Paradigm Publishing, 2015), Kindle Locations 2381-2387. Emphasis mine. Dennis McCallum, Liberation! (Columbus, OH: New Paradigm Publishing, 2015), Kindle Locations 2495.